The Wild West Book Fair is in full swing! If your child wants to buy a book during school hours, please place money in a bag. All books will have tax added to the total so make sure they bring enough money to cover tax. Thursday: 7:15 a.m.-8 p.m. Pajama Day! There is a special Family Fun Night (6-8 p.m.). The children can come dressed in their pajamas at school and for the Family Fun Night. Do you have family who wants to order books for your child but cannot make it next week? Order now until Nov. 18 at the online book fair! We need your help during the Book Fair so please volunteer – use this link to sign up!! Join Summitt Elementary for Thanksgiving Lunch on Thursday, November 16, 2017. Thanksgiving lunch includes all-natural sliced turkey and gravy or vegan lentil chili Frito pie. Diners may select up to four sides: whole wheat rolls, garden salad, local Texas apples as well as scratch-cooked traditional cornbread dressing, roasted garlic mashed potatoes, whipped sweet potatoes, seasoned green beans and blueberry crisp. A guest meal is $3.50. In compliance with AISD policy, all lockdown drills are to be planned in advance and announced to parents and staff at least 24 hours in advance before the lockdown drill. Lockdowns are conducted for intruder or violence on campus. A lockdown drill should take no longer than 30 seconds to complete and students will be given an opportunity to process the experience by their teacher. In accordance with this policy, this is our official notification that a lockdown drill will be conducted on Friday, Nov. 17 at 9 AM. Come out and cheer on our Summitt Lion and Dragon Dance Team as they perform in the annual Chuy’s Children Giving to Children Parade. It will be on Saturday, Nov. 18 at 11 a.m. The parade will go from the Capitol to the Ann Richards Congress Bridge. Bring an unwrapped gift to benefit Blue Santa. If you cannot make it downtown, watch it live on CBS Austin. Last week you should have received a special flyer with an image of a piece of art created by your child and a special code for ordering online from the Original Works Art Fundraiser. This is a PTA fundraiser that benefits the school and also gives you the chance to purchase some really neat things with your child’s art on them. The items make wonderful grandparent gifts and will be sent to you in time for the holidays. Please make sure place your order before November 20. A handful of students received paper order forms – the deadline for ordering with the paper form was November 13. Contact lisawolf@gmail.com with questions. Parents can now access your student’s Fitnessgram results through the Parent Cloud. All 3rd-12th grade students enrolled in PE or a PE substitution must be tested. Previously, providing Fitnessgram results to parents required that teachers print individual scores by class. After working with AISD programmers, A Fitnessgram tile has been placed in the Parent Cloud featuring student results in English and Spanish. Log in to the Parent Cloud, they type “Fitnessgram” in the search box and click on the tile. Parents will see their children listed, and upon choosing one, they will see scores as well as additional information including assessment explanations, standards, and requirements. There is also a Spanish translation option. There will be a final meeting for everyone who is going on the trip to Vietnam this winter break. It’s Tuesday, Nov. 28 at 5:30 p.m. in the library. This will be your chance to get last minute advice and information. Please thank Thanh Doan, Sarwat Rahman, Nicholas Sohadaseni, Sarah Spence, Tori Tamblia and Brenda Wood for their hard work. They provide much-need support to our classrooms! Teaching assistants may teach parts of a lesson or teach a small group of students who need extra instruction. 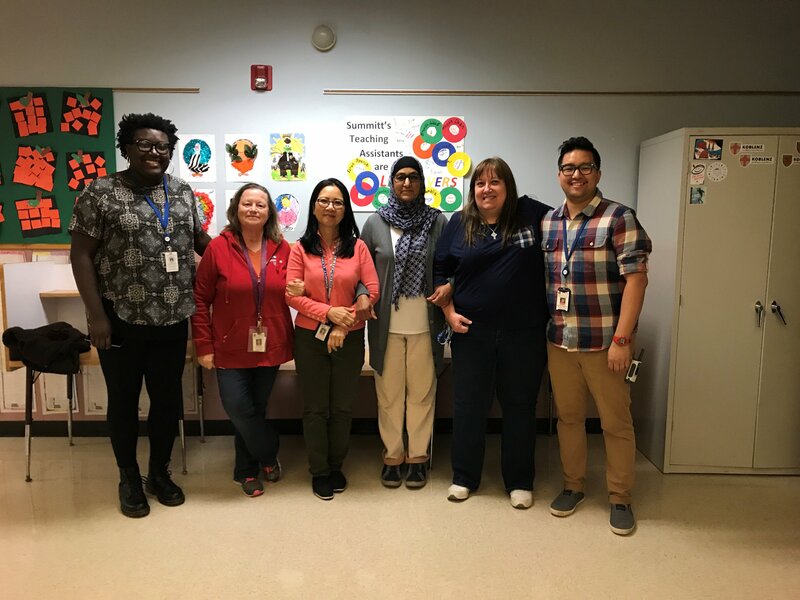 Many TAs work one-on-one with special needs students, shadowing their student and assisting with class work, organization and behavior management. Teaching assistants often serve as an extra pair of eyes in the classroom, responding to students’ needs as they arise. Please take a look in the lost and found for your student’s possessions, it is full of coats, clothing, backpacks, lunch boxes and water bottles. The lost and found is located to the right of the front doors, in the music hallway, after you enter the building. All items not claimed by Thursday, November 16 will be donated to Coats for Kids!! If you have time 10:30 am to 1:30 pm (or any time in between) on Tuesdays and/or Thursdays, please consider helping out in Summitt’s cafeteria. We have only one lunch monitor at this time on those days. Contact the front office if you are able to assist. The third grade needs clean, dry Pringles cans (with lids). Please drop them off in a labeled container in the Great Hall. Thank you! Brownie Troop 2028 is collecting new reusable water bottles and unopened packages of wipes. The collection is starting October 30th, 2017 and ends on November 30th, 2017. We are collecting these water bottles and wipes for kids that don’t have permanent homes. All donations are going to The Center for Child Protection. We set a goal for a hundred water bottles and wipes. The box for donations is in the Summitt Great Hall. More info is here. Many AISD students live in food insecure households and access to healthy food may be challenging when AISD is closed. In preparation for the Thanksgiving break, our food services team is working with schools to share information from the Central Texas Food Bank about resources that help keep families fed throughout the year and during school breaks. If you need assistance, please contact Summitt’s office for an emergency food assistance referral list with locations where families can get food assistance (English and Spanish) and November calendars for the food bank’s mobile food pantries and Fresh Food for Families distribution locations.